Knitting at the Movies: Comic Books Galore | Knit Like You Mean It. Not interested in comic book movies? There’s a giveaway at the end of this post. Scroll, people, scroll! Captain America’s Villain, The Red Skull: if only someone had knit him a hat, a lot of trouble might have been avoided. Photo courtesy Marvel Studios. Though I’m certainly not suggesting that the only good movie is one with a colon in the title, I’d say Thor was the weakest of the bunch. The actors did their best, but the Thor story is weak already. Thor suffers from the same problem Superman does: if you’re near-invincible, what can we really do to you? 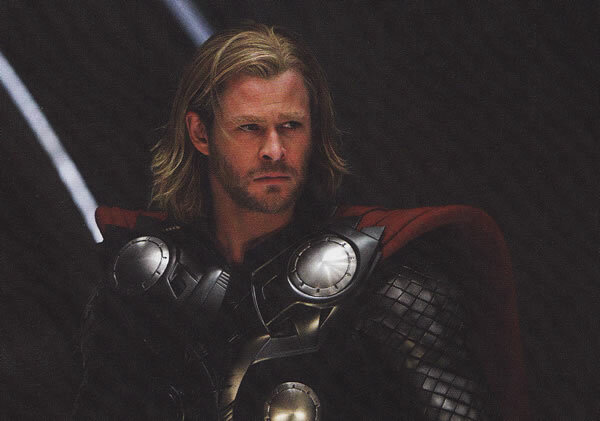 Much as Superman’s issues were often of the heart, Thor’s issues in this film are largely emotional. He spends the film facing his baggage: a disapproving father, a jealous brother, a move to a strange new town. While all this angst is eminently relate-able to the average American moviegoer, it didn’t make for a great action film. Thor is looking sad, possibly because he had to knit that whole cape himself. A fairly simple plot; in other words, if you look down at your knitting briefly, you won’t miss a key twist. Enough special effects that the theater is periodically lit up by an explosion, enabling the intrepid knitter to pick up a dropped stitch. You can see that an action film is just the ticket. So Thor was just fine; I suspect my problem was just that I had high expectations. And, hey, I got a lot of knitting done on a Tea Leaves Cardigan I’m making for a friend. The X-Men: First Class: James McEvoy sports some nifty hand-knit mitts. Photo courtesy 20th Century Fox. As always, the X-Men had me waxing philosophical: is this really a story about the differences between American and European reactions to the horrors of World War II, or is it more about racism in America? Or both? More importantly: how do we know that Professor X would eventually win out over Magneto, morally if not actually? Well, check it out: he’s wearing hand-knits, while the man who can bend metal wears an alloy hat. Moving on: I’ve heard this described as the best X-Men film of the bunch, and I can see that. January Jones is pretty flat as Emma Frost, but otherwise – the tone is right, the effects are well-done, and James McEvoy is perfect as the young Xavier. The Great Big Pile of Knitting: perfect for the movies. Captain America really could have had more knitting. It’s World War II, people. Everyone should be knitting for soldiers. Am I right? At the very least, least we could have seen some nice retro sweaters on Cap’s love interest, Peggy Carter. Knitting aside, Captain America was my favorite of the bunch. Tommy Lee Jones has an excellent cameo as (what else?) 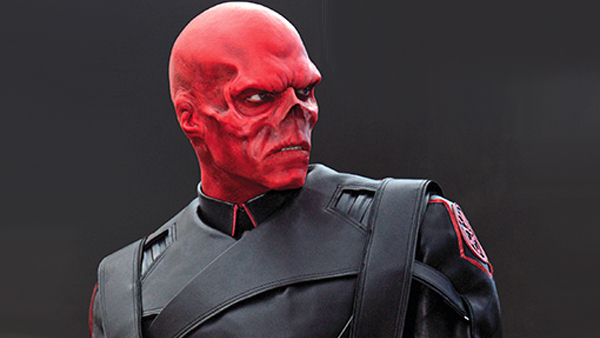 a cranky drill sergeant, and Hugo Weaving was just right as the Red Skull (also? best villain name ever). 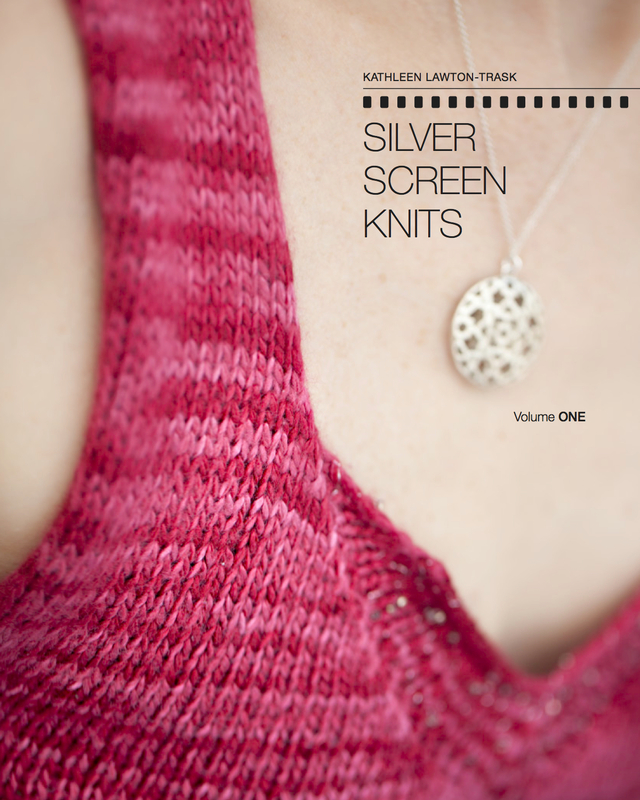 Meanwhile – what does one knit at the movies? For a long time, I knit ribbed socks – around and around, k2 p2 k2 p2…that worked well. Right now, I’m lugging this hilarious Pile Of Knitting that I’m making for the Saffron Walden Knitted Maze. I admit that I cheated a little: I grafted three hand-knit scarves together (Mr. Trask wasn’t wearing them) and am now adding more knitting in the edges. It seems to be working pretty well – and it’s a nice warm blanket to have in an air-conditioned movie theater. So, what about this week? Do you guys think there might be any knitwear in Cowboys vs. Aliens? More Canopy Worsted: one skein in Orchid, one in Chiclet Tree, one in Cat’s Claw. 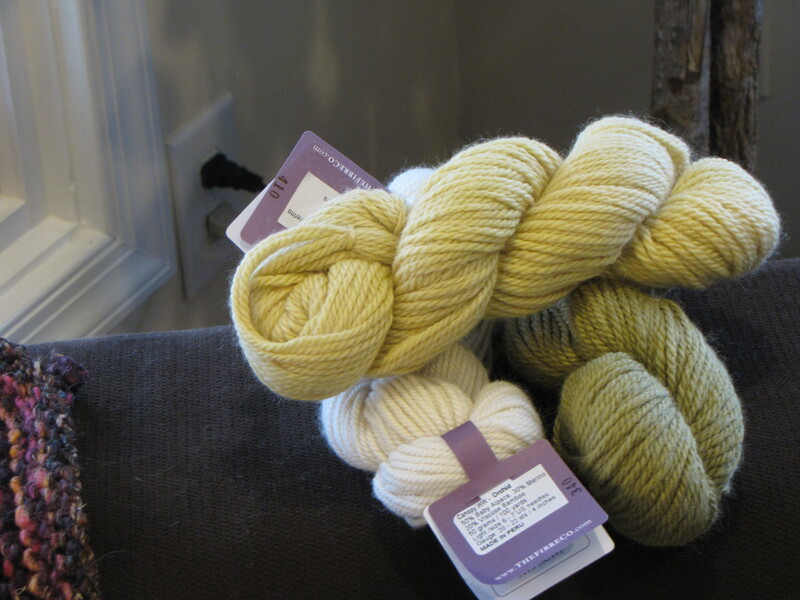 One skein of Dazzle from The Natural Dye Studio. This yarn is Bluefaced Leicester and carries the prestigious British Yarn label. Color: Spice. Yum. One skein Dream in Color Smooshy in color Candy Floss (December Dream Club) and one skein Artyarns Supermerino in Color 114. Two skeins of Mochi Plus: one in Feldspar and one in Autumn Rainbow (I think; no label). 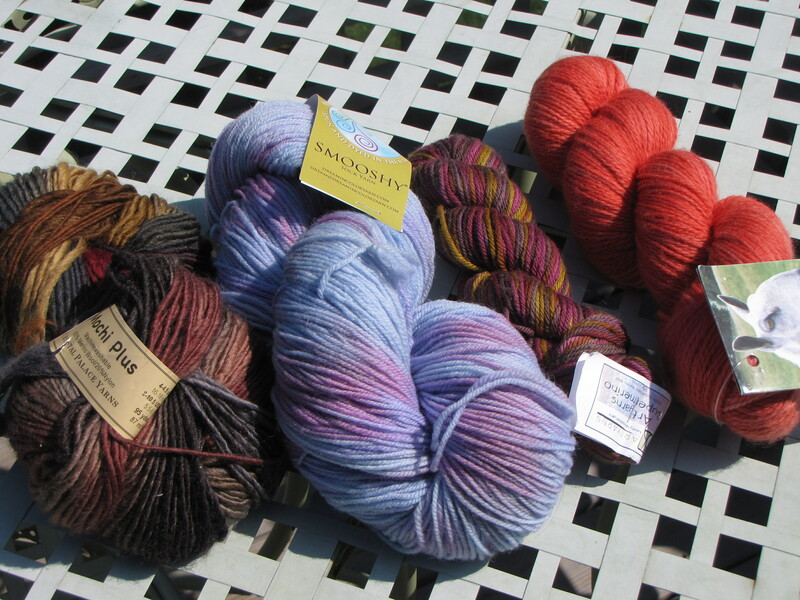 Yarn Giveaway #86,014: left to right, Mochi Plus, Dream in Color, Artyarns, Natural Dye Studio. As always, the yarn has been stored in airtight containers in my non-smoking, one-cat home since being purchased. Before mailing, I freeze the yarn for 24 hours. Comment on the blog by Saturday, August 6 at noon EDT for a chance to win: What movies have you watched this summer? Do you knit at the movies? And do let me know which yarn is most appealing to you – last week, I was able to send everyone the yarn they wanted! I love all your giveaways, but I’m partial to that orange-looking Natural Dye Studio. Not everyone loves orange but I do. To be honest, I am unable to stomach the price of seeing a “real” movie in a theater. Too often, after watching a $1/night movie from Redbox, I say to myself “Man, am I glad I didn’t pay more than a dollar for that pile of ****!” That being said, my last foray into the land of Twizzlers and addicting popcorn with buttery flavored topping (oh no, not butter – it must be buttery flavored topping!) was to see Shutter Island. And, of course, the book was better than the movie. I probably should have saved myself the hassle, since it’s one of my all-time favorite books and the only movie that I can remember that has truly lived up to my expectations is Silence of the Lambs, but oh well. However, I did watch The Adjustment Bureau over the weekend and I was impressed. Not a good movie for knitting though – too many plot twists and turns. I found it very entertaining, but not so confusing that my brain hurt afterwards (think Inception or Memento). So for now, I’ll continue knitting while watching completely mindless tv. The key here is that I don’t feel guilty for tuning into such shows as Toddlers and Tiaras and Bridezillas, since I’m getting a ton of knitting done at the same time! Now I have a free pass to a multplex theater, and after much deliberation over what’s currently available, I chose Cowboys and Aliens. I’ll have to keep my eyes peeled for knitwear. Boom-Stick! One of my favorite lines of that movie. Do report back on C&A. Is Daniel Craig’s hotness a good enough reason to go? im more of a rental type of movie watcher..and i love to knit while im watching a movie..i just watched blue valentine and i thought that was pretty good! that smooshy looks yummy! Most of my movie watching is done at home on Netflix but i do like to go to the theater for those movies that would be best on the large format. I’ve seen Harry Potter (great), Transformers and X men recently. (We’ll not mention Smurfs or Cars 2.) I usually try to get there early. Quite often I am the first one to sit down. That way I have plenty of time to sit and knit before it gets dark. I don’t trust myself to knit in the dark. All of your prizes are so beautiful, I think 1 and 3 are my favorites. Number 2 then 4 follow closely behind in my preferences. Thank you for the opportunity. I won again? That is awesome! When was the last time I watched a movie in theaters? No idea! Since the time my kiddo entered this world, it is a full stop to movies. I can’t knit in theaters anyway, I want bright light when I am knitting. 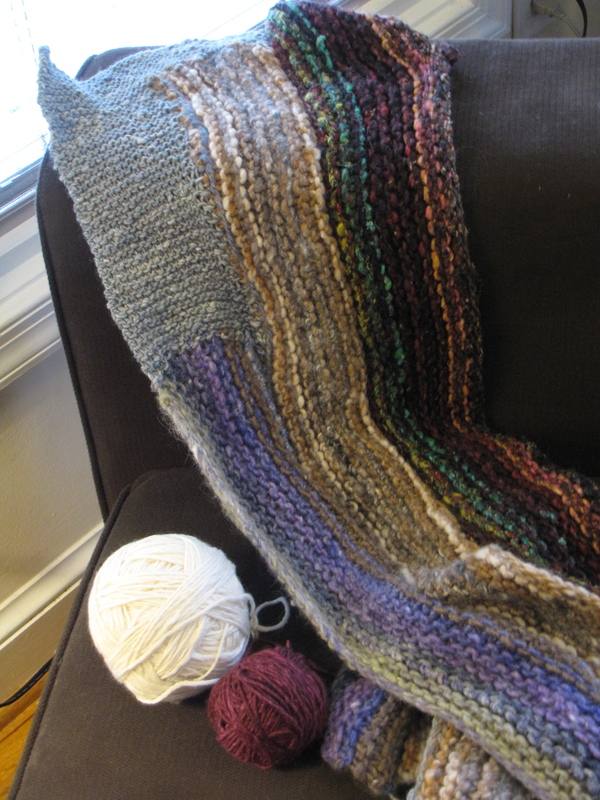 As for choice of yarn, I would like Dream in Color + Artyarns combo please, if I may. Thanks for having these lovely giveaways. I think the only movie I’ve seen this summer is Midnight in Paris, but I saw it TWICE. I loved it so much! It was funny, whimsical, and dreamy, and reminded me of when I lived in Paris (2003-2004). I haven’t tried knitting at the movies, mostly because I’m really bad at following movies so I need all my attention to be focused on the movie, otherwise I get miserably lost and confused. Thank you for offering these great yarns! I would love to try the Canopy Worsted. Knitting at the movies?! Wow. Haven’t done that yet… although I am often KIP (knitting in public) and have no shame doing so! I knit at home watching TV, but cannot fathom the jump to knitting in the theatre. Although I will remember to bring it along next time while waiting through the 1/2 hour of previews. Since when is this acceptable??!! One or two is fine, but more than that and I feel held hostage. Will even pick it up, as I’m in Alexandria too, or will pay shipping. Thanks for the fun giveaways. This summer I’ve been to see the X-Men movie, and also the last Harry Potter movie (both in 3D and the usual way – the 3D isn’t worth it). I liked both very much, although my favorite X-Men movie would still be the second one. I knit before the movie itself but am not confident enough to knit in the dark. I saw Bridesmaids (with a bunch of knitters!) but not much else this summer. I’d love to win the Smooshy… it could be friends with my unused club skein. I don’t watch many movies. I think the only one I’ve watched in its entirety this summer is The Corporation. All the yarn is gorgeous, but my first choice would be the Dazzle (and I’d choose the Smooshy before the heavier yarns – I mostly knit socks). You know well I would welcome any and all lighten-Kathleen’s-moving-load donations you care to spin my way (PFI). No, I do not knit in the movies. First, because I don’t go to the movies enough to do so. If I confined myself to movie knitting, well, I’d be even slower than I already am at completing projects (remember that cowl I started?) Second, when I do go, I want to direct all of my attention to the flick. Last seen (first in six years, I think) was HP7 in 3D. I was in awe and totally smitten with the glasses and effects. I can still feel the itchiness of the Death Eaters blowing by me and want to dust off the flakes from…uh oh, spoiler. I’ll stop now. Midnight in Paris….It just made me dream of being back there, and it was fantastic. My cat is name for Zelda FitzGerald, so I was especially pleased to see her character done so well in the movie. I’m still hoping the next time I’m there I bump into Zelda and Scott. By the way, I adore the ArtYarns. Thanks for writing. thanks again for the opportunity to win more yarn – great choices – i can’t imagine what you are not giving away!